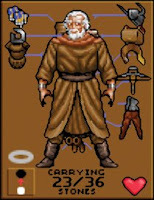 Throughout the Ultima series Iolo (pronounced 'yo-lo') is a close companion of the Avatar. He is an accomplished bard and world-renown bowyer. His finely made bows and crossbows are made available in his shop in Britain. When not adventuring, Iolo makes his home in the Deep Forest on the edges of the town of Yew. The image at left comes from the Ultima VII PC game. This character was modeled after a real-life friend of Richard Garriott. 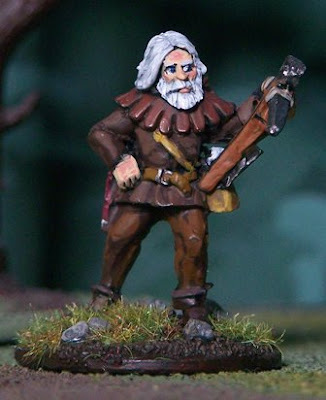 The above model comes from Old Glory Miniatures' "Revolting Peasants" set. I liked that this mini is dressed in a similar way to the character in The Black Gate—a tunic with hood. He is mounted on a 25mm metal washer. This is the same size base as used in GW's LOTR game, so he could easily be played with those rules. The level of sculpting found in the Revolting Peasants set is not the highest, but there are a few nice townspeople models found in there. In Song of Blades and Heroes I may assign the Wood Elf Commander traits to Iolo. This will account for his high status, archery skills and his ease of traveling through forested areas.